At 8:29 a.m. on Friday, Nov. 30, Jessica Connaher of Eagle River was in a bad way. A magnitude 7 earthquake had hit a few miles away, she had no means of transportation and she couldn’t get in touch with her son Steven, a freshman at Eagle River High School. Connaher was one of thousands of parents across the greater Anchorage area whose thoughts once they were out of immediate danger turned to their children, most of whom were already in classes at schools around the city. Though some students were able to contact their families almost immediately and put their minds at ease, many were unreachable, and parents feared the worst. Calls canceling school went out quickly, and the roads filled with parents rushing from home or work to collect their children. Drives that ordinarily took a few minutes became hourlong commutes. Fortunately, parents would soon find their children were in good hands. Connaher pulled up at Eagle River High as students huddled together outside, supervised by their teachers. Her son, unable to contact her, had made arrangements to go home with a friend and keep trying to call her from there. “He was just getting into their car further up in line when I arrived and had his name called,” Connaher wrote. And for the first time ever, she was happy to see her son improperly dressed for the near-freezing temperatures. Stories like Connaher’s played out that morning throughout the Anchorage School District. 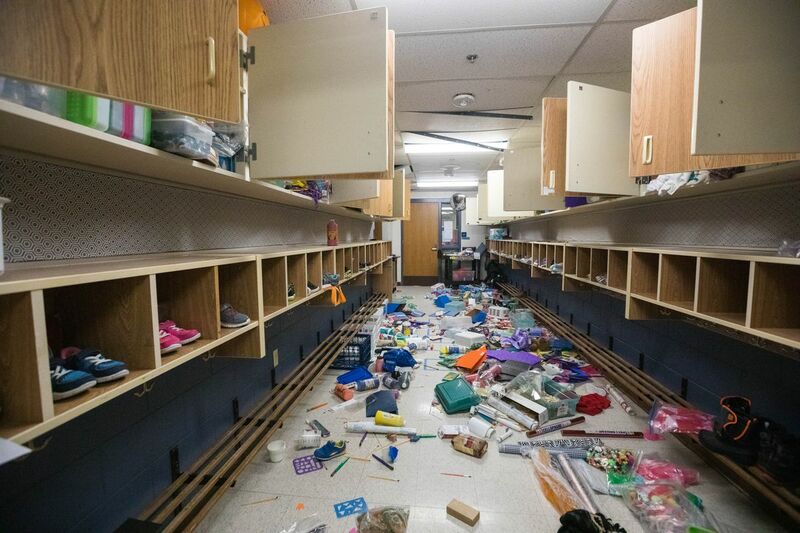 As videos showed, teachers, students and support staff did exactly what they were supposed to during the earthquake. Teachers, though affected by the earthquake themselves, projected calm and gave clear instructions to students, keeping them under desks until well after shaking stopped and shepherding them out of the building quickly when fire alarms started to blare. When it was safe to do so, they let students contact their families and let them know what was going on. In some instances, they even used the quake as a teachable moment, talking to students about the processes behind earthquakes and how they affect Alaska. Systems like ASD are complex, filled with thousands of policies, procedures and people. But in moments of crisis, it’s what people do on an individual, person-to-person scale that matters most. And when the earthquake came, the people in classrooms across the city — teachers, staff and students alike — did just what they were supposed to. They remembered their training, they took it seriously and they kept each other safe. As parents, as friends and as community members, they did us proud. Correction: An earlier version of this editorial incorrectly stated that the name of Jessica Connaher’s son is Colin. His name is Steven. The views expressed here are those of the Anchorage Daily News, as expressed by its editorial board, which welcomes a broad range of viewpoints. Current editorial board members are Ryan Binkley, Andy Pennington, Julia O’Malley, Tom Hewitt and Andrew Jensen. To submit a piece for consideration, email commentary@adn.com. Send submissions shorter than 200 words to letters@adn.com or click here to submit via any web browser. Editorial opinions are those of the Anchorage Daily News editorial board, which welcomes responses from readers and a broad range of viewpoints. Editorial board members are Ryan Binkley, Andy Pennington, Tom Hewitt and Andrew Jensen. To submit a letter or longer commentary for consideration, email commentary@adn.com.